The Yangtze River basin supports one third of China's population and produces more than 40% of China's GDP. However, similar to other large rivers around the world, the Yangtze is also confronting a severe water crisis. Freshwater ecosystems are by far in worse condition than forest, grassland, and coastal ecosystems. Half of the world's wetlands may have been destroyed in the past 100 years alone. In the coming decades, problems associated with the lack of fresh water are set to reach global proportions, with water shortages expected to become severe in at least 60 countries by the year 2050. Nearly half of the global population is living without safe water or adequate sanitation, millions of homes are under the threat of recurring floods, and drought and desertification are undermining advances made in food production. The loss of up to 50 per cent of freshwater species over the past 30 years signals that one of the underlying causes of the freshwater crisis is the continuing degradation of land and water ecosystems. Specifically, China is facing severe water problems that include floods, water shortage, pollution,soil erosion; deterioration of freshwater ecosystems; fragmentation and loss of freshwater biodiversity, low utilization rate of water resources in some places and over development of water resources in others. Freshwater ecosystems are by far in worse condition than forest, grassland, and coastal ecosystems. Conceived by the China Council for International Cooperation on Environment and Development’s (CCICED) Task Force on Integrated River Basin Management (IRBM) in 2004, the Yangtze Forum calls for a comprehensive and collective approach to tackle environmental and social issues in the Yangtze River basin. The first forum was held in Wuhan from 16-17 April 2005. Officials from the central government and all 11 provinces and municipalities in the Yangtze River Basin, together with representatives from 14 countries and a couple of international organizations, including WWF and the Global Water Partnership (GWP) attended the forum. The concept of IRBM has been incorporated into the Yangtze Declaration on Protection and Development released during the forum. WWF also supported the second Yangtze forum in Changsha in 2007 which passed Guiding Principles for Dongting Lake Protection. The third forum was held in Shanghai in April 2010. WWF’s Director General James P. Leape attended previous two forums and delivered keynote speeches at plenary sessions. He was introduced to Former Minister Wang Shucheng and current Minister Chen Lei of Ministry of Water Resources during the third forum. More than 11000 officials and experts have attended the Yangtze Forums so far and the Forum plays an important role in information sharing, decision-making and enhancing understanding and cooperation among stakeholders in the river basin. The International Yellow River Forum is one of the most recognized river events in the world, which is hosted by Yellow River Conservancy Commission (YRCC) of China. The river thematic conference is held every two years to address water challenges for river basin management. The first Forum was held in 2003. WWF China has been a supporter of the Forum since 2007 by either co-organizing panel discussions or providing technical and financial support. During the 4th International Yellow River Forum in October 2009, Georg Schwede, Director of Program Office Management at WWF International, delivered a keynote speech at the plenary session. Mr. Schwede also had the chance to meet with Commissioner Li Guoying of Yellow River Conservancy Commission during the forum. Two sides reviewed the progress in WWF and YRCC’s cooperation and discussed the plans of cooperation between WWF and the Commission. WWF China has been promoting a wetland conservation protection network to facilitate wetland protection and management throughout the Yangtze River Basin since 2002. Currently the network consists of 39 nature reserves and wetland parks, which cover a total area of 1.65 million hectares of wetlands in the central and lower Yangtze Basin. Six wetland nature reserves have been selected as pilot sites to demonstrate effective wetland management approaches and to serve as demonstration sites for other network members. 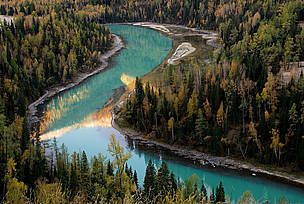 The Yangtze wetland network has been highly acclaimed by China’s State Forestry Administration. The National Wetland Protection and Management Center of China has officially announced that they would like to support the network, and hope to promote and repeat the networks’ success throughout China. Together with Chinese Academy of Sciences (CAS) and the Yangtze Forum Secretariat, WWF China released “Yangtze Conservation and Development Report” in 2007 during the second Yangtze Forum. The report drew attention from China’s State Council and Chinese Premier Wen Jiabao encouraged relevant ministries to take the report as reference. The English version of the report was also released at the “International Symposium on Three Gorges Project & Water Resources Development and Protection of Yangtze River” in October 2008. “Yangtze Conservation and Development Report 2009” was released with CAS and China Development Bank in Beijing this April. “Yangtze Conservation and Development Report 2011” will be released during the forth Yangtze Forum in 2011. Estuary is called pulse of river, which reflects the status of the whole river basin and the health of estuary relies on the health of the whole river basin, however, estuary are facing lots of threats caused by human activities like upstream infrastructures, pollutions, navigation, urbanization, etc. During 2010 Shanghai World Expo, WWF launched World Estuary Alliance with the following vision: Estuary cities/regions will need to act on climate change. The partners of the World Estuary Alliance believe human development and nature conservation go together. Key concept of WEA vision is to combine “natural solutions” and “low carbon city principles” in order to better adapting to climate change. Yangtze wetlands provide habitat for 95% of the wintering Siberian crane population, 80% of the world's lesser white-fronted geese population, and are the home of the endemic Pere David's deer (which was extinct in China but has now been successfully reintroduced). They are also home to highly endangered endemic aquatic animals including the Yangtze river dolphin, the Chinese alligator, otters, and fishes such as the Chinese sturgeon.